We aim to design two sampling methods, the grid and sectoral methods, to provide more precise detection of focal corneal scar changes with time following pterygium excision with the Pentacam imaging system. This is a retrospective study of our previous prospective observational case series. 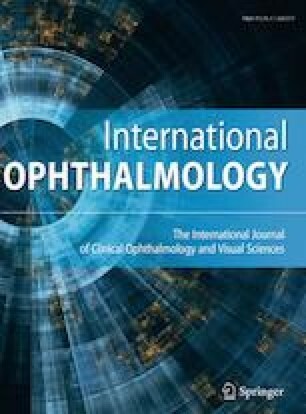 Thirty patients underwent primary pterygium excision with adjuvant topical mitomycin-C application were followed up and imaged with Pentacam system at postoperative weeks 1, 4, 12 and month 18. Grid and sectoral methods were used to sample density changes (in grayscale units, GSU) over the scarred areas as well as the clear pole of the same cornea. Using the grid method, the average corneal densities were 39.4, 37.1, 36.7 and 34.7 GSU at postoperative 1, 4, 12 weeks and 18 months, respectively. On the other hand, using the sectoral method, the average corneal densities were 35.3, 33.3, 32.5 and 31.9 GSU at postoperative 1, 4, 12 weeks and 18 months, respectively. Paired t tests achieved statistical significance when comparing all follow-up time points to first postoperative visit. A statistically significant effect of time on the average density was shown on ANOVA (p < 0.001) using both analyses over the scarred areas, but not over the clear pole of the same cornea (p > 0.05). Our novel approach to monitor corneal density changes using the grid or sectoral sampling methods seemingly enhances the power in monitoring density changes in corneal scars when compared to conventional total-diameter average densitometry.